A tenacious and incredibly skilful centreman, Simon Atkins forged a reputation as one of the premier midfielders in the VFL/AFL during the early days of the national competition, and later turned his hand to coaching. Born in Launceston in 1968, Simon Atkins moved to Wynyard as a child and it was here that his football journey would begin. After playing through the junior grades with the Cats, he made his senior debut aged just 15 in 1984, and the following season he was selected to play for Tasmania in the Teal Cup U/18‘s competition under Garry Davidson. In 1986 Atkins and his twin brother Paul were approached by VFL club Footscray, and both signed a ‘Form Four’ tying them to the club for two years; Paul’s career never took off, however Simon’s Victorian sojourn was far more accomplished. 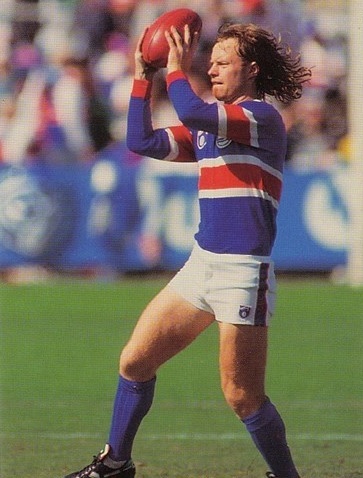 Atkins made his senior debut for Footscray in Round 2, 1987. It would be a day to forget for the Bulldogs, as they were thumped by Sydney by 108 points, although Atkins would contribute 2.1 of his side’s 11.13. Unfortunately there would be only another two senior appearances for Atkins in the next two years, and despite playing in Footscray’s 1988 reserves premiership triumph it wasn’t until 1989 that he cemented his place in the senior side, finding his niche as a centreman. Fierce determination, lightning quick hands and extraordinary vision helped him to rack up consistently high disposal numbers and form part of the great Bulldogs midfield of the early 1990’s along with names like Wynd, Hawkins and Liberatore. 1989 would also bring the first of four matches in the famous ‘Map’ Guernsey of Tasmania, the most noteworthy being Tasmania’s stunning upset win against Victoria in 1990. After further consistent seasons from 1991-93, Alan Joyce’s arrival in early 1994 signalled the end of Atkins’ halcyon days at Footscray. Joyce was of the opinion that Atkins lacked the versatility required of a player in the modern game, and after only 14 senior appearances for the season Atkins was delisted. After training with Collingwood for a large portion of the 1994/95 off-season, Atkins eventually found himself lining up with Fitzroy in 1995. The once-proud Lions were on their knees as a club and were often non-competitive, however Atkins was regularly amongst the Lions’ standout performers during the club’s final days. As a member of the last Lions side that played Fremantle in Round 22, 1996 Atkins had the distinction of kicking Fitzroy’s final AFL goal moments before the final siren; however it wasn’t enough to keep the Lions from bowing out with an 86-point hammering. Following Fitzroy’s demise, Atkins headed home to Tasmania, however he eventually returned to Victoria to play for VFL club Werribee. In four seasons and 78 games Atkins would become one of the finest players in the club’s history, winning a Best and Fairest in his first season, VFL Team of the Year honours in his first two and selection in the Tigers’ ‘Team of the Decade’ a year after his retirement in 2000. After retirement, Atkins turned to coaching, guiding Werribee’s reserves to the flag in 2001. After a stint as an assistant at Coburg, Atkins returned to Werribee as senior coach in 2005, guiding the club to the Grand Final in his first season, where they unfortunately lost to Sandringham. He remained at the helm for another five years, but the success of 2005 never came again, and at the end of 2010 Atkins resigned as coach, citing his lack of desire to commit full-time to football.